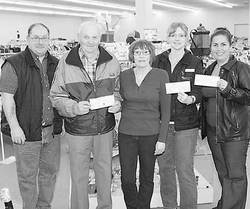 The Boys and Girls Club of Leduc and the Alberta Legacy Development Society (Leduc Grain Elevator) both received cheques from Second Glance totalling $10,800.00 to assist with their programs. The ALDS will be using their money to help with the cost of their Canada festivities amongst other things, and the LBGC has slated their dollars toward their Summer Day Camp Program and to send two members to the National Conference in Kamloops this summer. With these presentations Second Glance has donated over $57,000.00 to various service groups within the community this year.